The following is from a series of articles I wrote for the education section of the Central Oregonian. Last month, Crook County School District completed the final stage of the computer rollout for its 1:1 Learning Program. Sixth-grade students at Paulina Elementary, Powell Butte Elementary, and Crook County Middle School have laptops, one per student, which will be used to enhance their learning in the classroom. 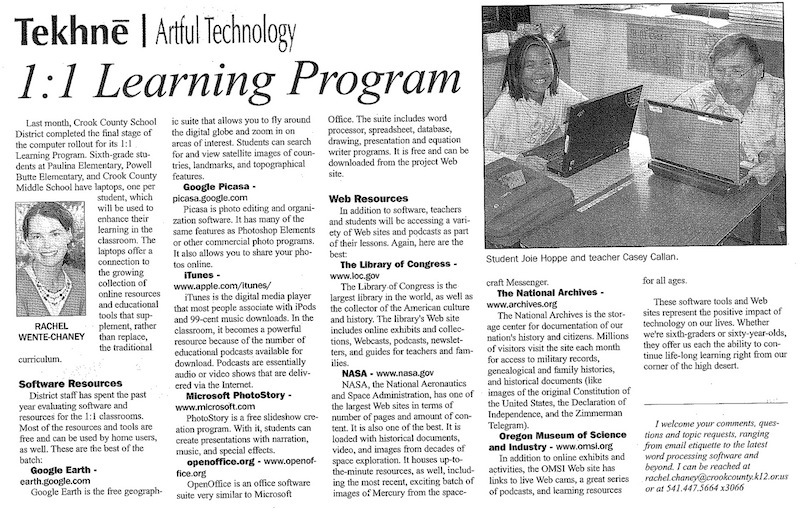 The laptops offer a connection to the growing collection of online resources and educational tools that supplement, rather than replace, the traditional curriculum. Google Earth is the free geographic suite that allows you to fly around the digital globe and zoom in on areas of interest. Students can search for and view satellite images of countries, landmarks, and topographical features. Picasa is photo editing and organization software. It has many of the same features as Photoshop Elements or other commercial photo programs. It also allows you to share your photos online. iTunes is the digital media player that most people associate with iPods and 99-cent music downloads. In the classroom, it becomes a powerful resource because of the number of educational podcasts available for download. Podcasts are essentially audio or video shows that are delivered via the Internet. PhotoStory is a free slideshow creation program. With it, students can create presentations with narration, music, and special effects. OpenOffice is an office software suite very similar to Microsoft Office. The suite includes word processor, spreadsheet, database, drawing, presentation and equation writer programs. It is free and can be downloaded from the project Web site. The Library of Congress is the largest library in the world, as well as the collector of the American culture and history. The library’s Web site includes online exhibits and collections, Webcasts, podcasts, newsletters, and guides for teachers and families. NASA, the National Aeronautics and Space Administration, has one of the largest Web sites in terms of number of pages and amount of content. It is also one of the best. It is loaded with historical documents, video, and images from decades of space exploration. It houses up-to-the-minute resources, as well, including the most recent, exciting batch of images of Mercury from the spacecraft Messenger. The National Archives is the storage center for documentation of our nation’s history and citizens. Millions of visitors visit the site each month for access to military records, genealogical and family histories, and historical documents (like images of the original Constitution of the United States, the Declaration of Independence, and the Zimmerman Telegram). In addition to online exhibits and activities, the OMSI Web site has links to live Web cams, a great series of podcasts, and learning resources for all ages. These software tools and Web sites represent the positive impact of technology on our lives. 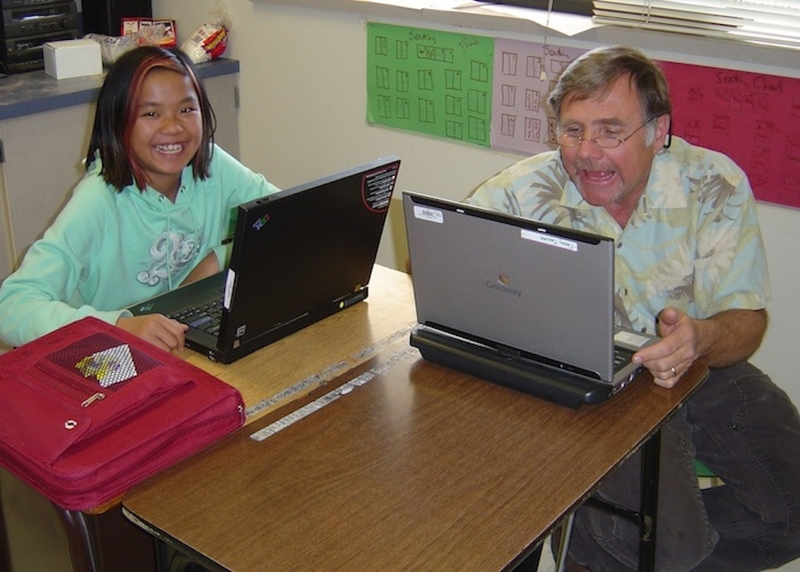 Whether we’re sixth-graders or sixty-year-olds, they offer us each the ability to continue life-long learning right from our corner of the high desert.